The GT Energy Frontier Research Center is advancing the understanding of how acid gases interact with energy-related materials. Dr. Israel E. Wachs, the G. Whitney Snyder Professor of Chemical and Biomolecular Engineering at Lehigh University's P.C. Rossin College of Engineering and Applied Science has been elected as a fellow of the National Academy of Inventors (NAI). The NAI describes the honor as "the highest professional distinction accorded to academic inventors who have demonstrated a prolific spirit of innovation in creating or facilitating outstanding inventions that have made a tangible impact on quality of life, economic development and the welfare of society." The latest issue of Frontiers in Energy Research features UNCAGE-ME. Your team's research appears in Scientists Discover Stable Material for Sulfur Dioxide Capture (https://www.energyfrontier.us/content/scientists-discover-stable-material-sulfur-dioxide-capture). Rochelle Moses has joined UNCAGE-ME as the Program Manager for the Center. DOE Awards $100 Million for Energy Frontier Research Centers. UNCAGE-ME EFRC is among 22 new and 9 renewed EFRCs to be awarded an EFRC grant. We are excited to continue our research mission for the next four years! Congratulations to Professors Ryan P. Lively and Christopher W. Jones as the winners of the 2018 Energy & Fuels Joint Award for Excellence in Publication for the article “SOx/NOx Removal from Flue Gas Streams by Solid Adsorbents: A Review of Current Challenges and Future Directions”. 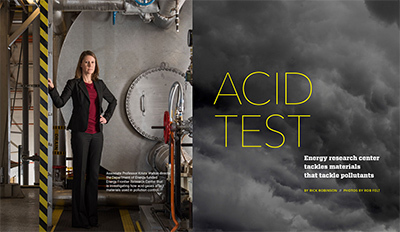 Energy & Fuels and the ACS Division of Energy & Fuels sponsor this annual award, which honors an outstanding article published in the journal within the past five years. We are excited to share that the latest issue of Frontiers in Energy Research features UNCAGE-ME. Our team's research appears in The Importance of Being Defective (http://www.energyfrontier.us/content/importance-being-defective). Jonas Baltrusaitis' recent contribution to Catalysis Science & Technology has been highlighted as a HOT manuscript in 2017. More information is available here, and the publication can be found here. A GT news release highlights a publication from EFRC members David Sholl and Josh Howe, "One in Five Materials Chemistry Papers May be Wrong, Study Suggests​". Click here for more information. 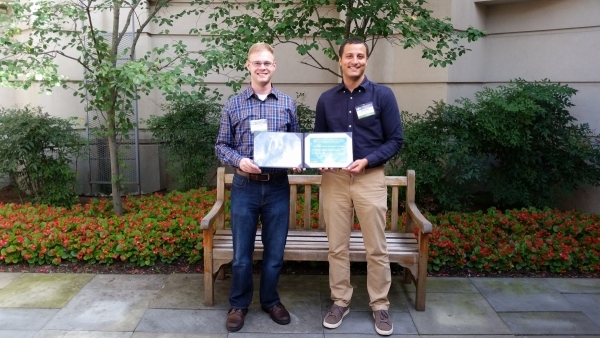 Robert M. Marti and Joshua D. Howe won the DOE Student and Postdoc Team Science Competition at the 2017 EFRC-Hub-CMS PI Meeting. Their presentation was entitled "Understanding Structure and Dynamics of CO2 Adsorbed in Open-Site Metal Organic Frameworks" and of the 30+ formal entries there were six awards given. To read more about their experience, their interview can be found here. Jonas Baltrusaitis was selected to receive a P. C. Rossin Assistant Professorship. This is awarded to the most outstanding individuals in the P. C. Rossin College of Engineering and Applied Science who have a high potential for establishing a successful career at Lehigh University through the integration of teaching and research. David Dixon's article, "Preparation and Characterization of Group 13 Cyanides" in Chemistry A European Journal was selected as the front cover picture. Click here for more information. UNCAGE-ME held its third All Hands Meeting this month on the GT campus. Students, postdocs and PI’s from the Center attended this two-day event as well as members of our External Advisory Board. At the meeting, awards were presented for this year’s Best Research Paper from the Center. Simon Pang won the Best Paper Award for his paper “Facet-Specific Stability of ZIF-8 in the Presence of Acid Gases Dissolved in Aqueous Solutions​”, while Difan Zhang received the runner-up award for his paper​ "Computational Investigation on CO2 Adsorption in Titanium Carbide-Derived Carbons with Residual Titanium​". Both awardees gave a presentation at the meeting on their work. Dr. Tina Nenoff from Sandia National Laboratories was our after dinner guest speaker. Additionally, the students and postdocs participated in team building activities. Ryan Lively has won a 2017 Faculty Early Career Development (CAREER) Award from the National Science Foundation. The CAREER Award is the NSF’s most prestigious award in support of junior faculty who exemplify the role of teacher-scholars through outstanding research, excellent education, and the integration of education and research within the context of the mission of their organizations. Ryan Lively has been selected to receive the 2017 3M Non-Tenured Faculty Award from the 3M Corporation. Lively received the award for his proposal “Next-Generation Molecular Separations.” This award recognizes “outstanding new faculty who were selected based on their research, experience, and academic leadership,” and recipients are nominated by 3M researchers. Michael Filler co-organized the Workshop on Nanomaterials Manufacturing for Energy Applications. 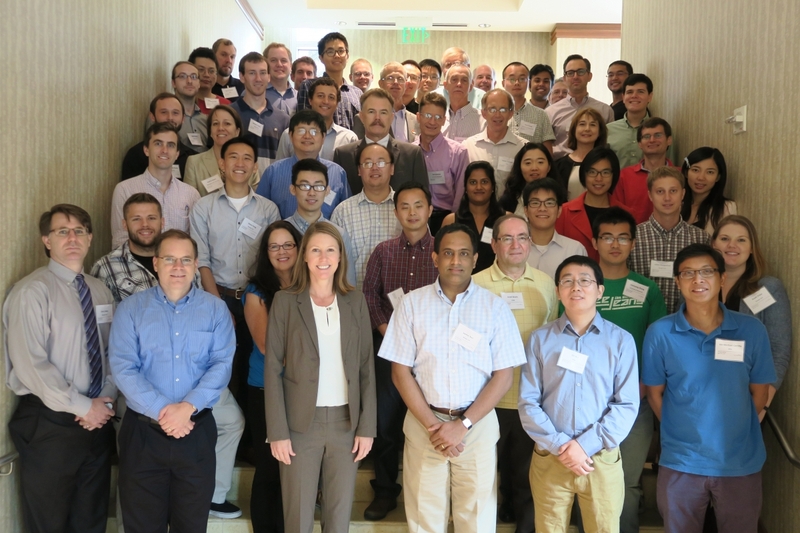 The workshop brought together experts in chemicals processing, nanomaterials, and energy conversion devices from across the United States to discuss the “chemical engineering-ification” of nanomaterials and nanodevice manufacturing. Sophia Hayes co-organized a symposium to honor Prof. Jacob Schaefer for his invention of CPMAS and REDOR NMR. This event was sponsored by ACS and Elsevier's Solid State Nuclear Magnetic Resonance journal, which hosted a special issue in conjunction with the event. Read more about it here. David Sholl co-chaired a Basic Research Needs Workshop on the topic of Energy-Water Nexus for the Basic Energy Sciences Division of the Department of Energy. Matt Tirrell from the University of Chicago and Susan Hubbard from LBL also co-chaired this workshop. Sophia Hayes helps shape national helium policy. Hayes served as a member of the committee that issued a report in October identifying federal steps necessary to address concerns from U.S. researchers due to the rising costs of liquid helium. This report was sponsored by the American Physical Society in partnership with the Materials Research Society and the American Chemical Society. Read more about it here. 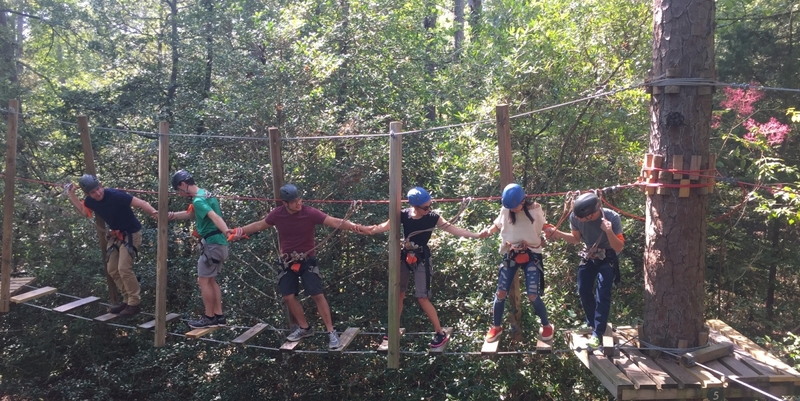 UNCAGE-ME held its second Student & Postdoc Retreat this month at Callaway Gardens. Student and postdoc researchers in the Center attended this day and half event that included both scientific discussions of ongoing work as well as teambuilding activities. Jonas Baltrusaitis invited to ACS Sustainable Chemistry & Engineering Early Career Board - the Early Career Board serves as a subset of the EAB and is comprised of academics 10 years or less from their initial faculty appointment. Energy Frontier Research Centers Program Booklet has been published by DOE BES covering the history and mission of the EFRC program. Accomplishments since the program's inception in 2009 are highlighted. Check it out Here. Krista Walton and Israel Wachs selected as 2016 AIChE award recipients​ - Krista Walton will receive the FRI/John G. Kunesh Award for oustanding contributions to separations technologies. Israel Wachs will receive the R. H. Wilhelm Award in Chemical Reaction Engineering to recognize significant and new contributions in chemical reaction engineering. Read more about it Here. Chris Jones has been selected by the American Institute of Chemical Engineers (AIChE) as the 2016 winner of the Andreas Acrivos Award for Professional Progress in Chemical Engineering. Each year, the award recognizes outstanding progress in the field of chemical engineering by one researcher in any area of chemical engineering research who is less than 45 years of age at the end of the calendar year in which the award is presented. Read more about it Here. Ah-Hyung Alissa Park joins UNCAGE-ME External Advisory Board. Prof. Park is the Lenfest Chair in Applied Climate Science at Columbia University and Director of the Lenfest Center for Sustainable Energy. She will replace our EAB member Prof. Doug LeVan who is retiring. David Sholl and Ryan Lively List “Seven Chemical Separations to Change the World” in a comment article published in the journal Nature. In the article, Sholl and Lively suggest seven energy-intensive separation processes they believe should be the top targets for research into low-energy purification technologies. Beyond cutting energy use, improved techniques for separating chemicals from mixtures would also reduce pollution, cut carbon dioxide emissions – and open up new ways to obtain critical resources the world needs. Read the full article Here. Ryan Lively has been selected as winner of Georgia Tech’s 2016 CETL/BP Junior Faculty Teaching Excellence Award. He will receive the award at the Faculty & Staff Honors Luncheon on April 22. Michael Filler has started a podcast called Nanovation, a forum to address the big questions, challenges, and opportunities of nanotechnology. Seven episodes are currently available. Click Here for a link to the podcast. Research from the Jones Group was highlighted in the latest Frontiers in Energy Research newsletter. Click Here for a link to the article. Chris Jones visited Pennsylvania State University Feb. 25 to give the departmental seminar in chemical engineering. In addition, he lectured at the DOE-BES Workshop on Fundamental Science Needs in Waste to Chemical Conversion on Feb. 29, and then visited the University of Illinois on March 3 for a seminar in chemical and biomolecular engineering. Krista Walton recently presented a seminar at Arizona State University’s School for Engineering of Matter, Transport, and Energy. This month the GT EFRC awarded two seed projects. Professors Sergey Vasenkov (University of Florida), Ryan Lively (Georgia Tech) and J.R. Schmidt (University of Wisconsin) were awarded a seed titled, “H2S diffusion on different length scales in advanced MOFs and its relationship with MOF structural and sorption properties”. Professors Jonas Baltrusaitis and Israel Wachs (Lehigh University) and Dr. Zili Wu (Oak Ridge National Laboratory) were awarded a seed titled, “CO2 and H2S – induced K2O-WO3/Al2O3 catalyst structural changes and reactivity”. Sheng Dai ranked among world's most influential scientists in the 2015 Thomson Reuters Highly Cited Researchers list - an annual list that recognizes some of the world’s leading researchers in the sciences and social sciences. Read more about it Here. ACS Central Science interview Dr. Livey and Dr. Jones regarding carbon dioxide capture and sequestration. Click Here for a link to the article. "The Leap" science blog interviews Dr. Lively & Dr. Sholl regarding their parody of "Fancy" for a JPC Letters Perspective article. Click Here for a link to the article. The EFRC held its first annual All Hands Meeting this month on the GT campus. This two-day event featured research updates from the principal investigators and researchers in the Center in addition to a poster competition. Simon Pang, a postdoc working at GT with Ryan Lively and Chris Jones won the first place prize. We were also very pleased to have John Pendergast, a Dow Chemical Fellow, give a lecture titled “Challenges for the Chemical Industry”. Sophia Hayes is selected as the recipient of the 2015 ACS Saint Louis Award. This award is presented to an individual who has made outstanding contributions to the profession of chemistry and demonstrated potential to further the advancement of the chemical profession. Susan Sinnott moves to Penn State - appointed head of materials science and engineering. Effective August 1, Susan will leave the University of Florida and take over as the head of the Department of Materials Science and Engineering at Penn State. Chris Jones is selected as a member of the 2015 class of ACS Fellows. He was recognized for his contributions in the development of materials for applications in catalysis and CO2 capture, his mentorship of graduate students and postdoctoral fellows, as well as his leadership in establishing ACS Catalysis.